Can your young child perform a two-foot landing with balance or demonstrate a circling movement with arms and other body segments? 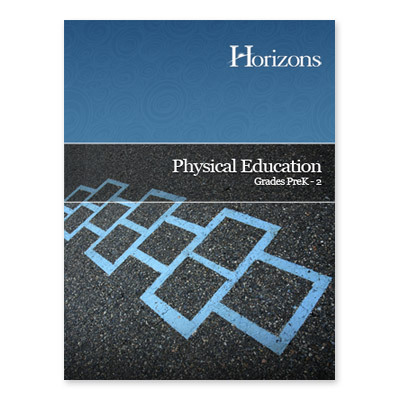 Horizons PreK-2nd Grade Physical Education from Alpha Omega Publications is a four year-in-one teacher's guide that develops your child's motor skills with fun exercises and creative movement games. No more haphazard approach to physical fitness! Systemically teach your child to remain physically active for life with Horizons PreK-2nd Grade Physical Education. This exciting teacher's guide gives your child a complete, well-rounded elementary education by teaching healthy living from a Christian perspective. Using interactive lessons that focus on building strength, endurance, flexibility, and sports knowledge, the Horizons PreK-2nd Grade Physical Education curriculum is designed to be used on a three-day per week format from preschool through 2nd grade. Comprehensive teaching instructions take the guesswork out of teaching physical fitness and include sample lesson plans; student activities and games; evaluation check lists; and psychomotor, intellectual, and decisional learning goals. So don't wait! Empower your child's physical well-being with the Horizons PreK-2nd Grade Physical Education curriculum from Alpha Omega Publications. Order yours today!